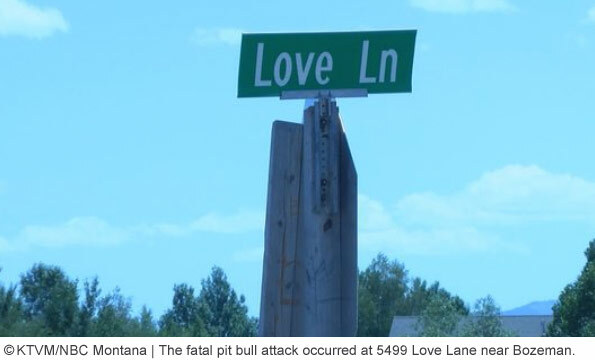 Melissa Barnes, 65-years old, died after being attacked by two pit bulls in Bozeman. UPDATE 09/13/17: A judge ordered a man to pay $15,500 in restitution to a victim's family after his pit bulls fatally mauled his landlord this summer. On June 24, 65-year old Melissa Barnes was attacked by two pit bulls belonging to tenant Wayne Bartlett. She was airlifted to a trauma hospital in Billings and pronounced brain dead the next day. Barnes was kept on life support for several days longer for organ donation awaiting rabies test results for the dogs; neither were vaccinated. During a restitution hearing Wednesday, Justice Court Judge Rick West ordered Bartlett to pay $15,504.74 with another $1,046.57 in interest. On July 24, Bartlett pleaded guilty to two counts of owning vicious and dangerous dogs and two counts of failure to have rabies vaccinations in Gallatin County Justice Court. A restitution hearing was scheduled after these proceedings. Bartlett told the Bozeman Daily Chronicle, he had no issue with the amount ordered by the judge. About half of the amount Bartlett was ordered to pay, $7,000, will go directly toward out-of-pocket medical expenses Barnes' family members "currently" face. Deputy County Attorney Jordan Salo told the Daily Chronicle the amount is minimal. "There are still medical bills coming out, but the family didn’t want to prolong this any longer," Salo said. We call it a "pittance" given the cost of an emergency airlift, life saving medical procedures and a delayed length on life support systems. Not to mention funeral costs and family members who had to disrupt their lives and bank accounts to contend with this horrific sudden loss of life. Bartlett said he could make a $500 payment each month, which would result in payments for 2.5 years. The first payment is due October 16. What we were not aware of -- we seldom hear about a restitution order of over $2,000 after a fatal dog mauling -- is that "restitution follows you through life," according to Judge West. “You cannot get rid of it through bankruptcy. You cannot get rid of it even if you were to die. The state would have to pay it. So it’s not going to go away," West said. Our hearts go out to Barnes' family members, who will never be the same after this sudden, violent and life-ending mauling by pit bulls that had been living on the victim's property for years. 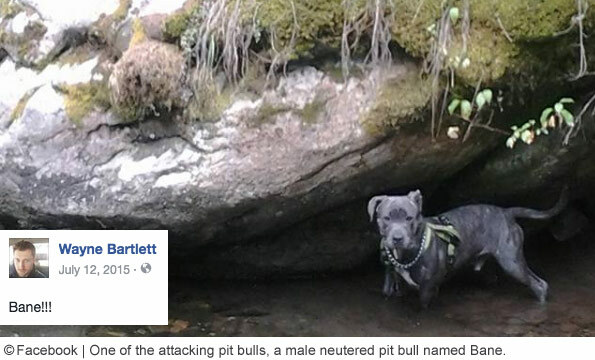 Bartlett may have had allegedly "good" pit bulls before they attacked that day, killing Barnes, but this unpredictability is a well-known trait in the pit bull terrier breed. Bartlett also elected to have a "multi-pit bull household," upping the danger risk exponentially, along with failing to vaccinate. On Tuesday, a Bozeman woman donated her organs and was taken off life support after being horribly mauled by two dogs over the weekend. Melissa Barnes, 65-years old, was left brain dead after two pit bulls belonging to a tenant attacked her Saturday. Doctors had to wait nearly three days after she was declared brain dead before taking her off life support because the dogs were not vaccinated. Doctors had to await the rabies tests results before donating her organs. Our hearts go out to this woman's family. There is no preparation for what they saw in that hospital room; the aftermath of a multi-pit bull mauling. The attack occurred on June 24 at 5499 Love Lane. The dog's owner, Wayne Bartlett, rented from Barnes and lived on the same property as her for six years. Comments left by Bartlett's girlfriend indicate that she lived upstairs. "She was the landlady upstairs," she wrote. Certainly Barnes was familiar with the pit bulls and vice versa. Bartlett's dogs -- Bane, a 6-year old male pit bull and Kitty, a 13-year old female pit bull-mix -- were put down, allowing the rabies tests to proceed at all. Neither Bartlett or his girlfriend were home when the attack occurred. Their pit bulls and children were under the care of Bartlett's niece. The children went outside where Barnes was working in the yard and the dogs followed. What shortly ensued was a violent unpredictable pit bull mauling that left a woman dead. The unpredictability and severity of attacks by pit bulls is why over 1,000 jurisdictions in the U.S. regulate this dog breed and worldwide, jurisdictions in over 40 countries. Bozeman, MT - The Gallatin County Sheriff's Office confirmed a woman was declared brain dead after being attacked by two dogs Saturday. The confirmation comes after conflicting reports earlier today about whether or not she survived her injuries. 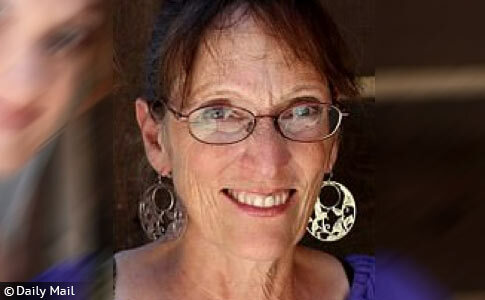 Melissa Barnes, 65, was pronounced brain dead on Sunday, Sheriff Brian Gootkin said during a press conference today. Both dogs were euthanized and are being tested for rabies. The results of the tests will determine future actions. The victim is an organ donor. This is why medical officials are waiting on the rabies results, Gootkin said. Neither of the dogs were vaccinated. Sheriff Gootkin said the attack happened Saturday morning at a home on Love Lane. Barnes was doing yard work at the time. The dogs belong to a tenant that lives on her property. The victim was airlifted to a trauma center in Billings, where she succumbed to her injuries. Gootkin stated that only one of the dogs, a pit bull, has been confirmed as the attacker at this time. It's unclear if another breed was involved. The investigation is ongoing as the family awaits rabies test results. Late evening news reports identified the dogs' owner as Wayne Bartlett, who seemed genuine in his interview with KRTV. Bartlett was not home at the time of the fatal mauling, but three children, including his niece, were. Bartlett said he and his pit bull "Bane" have rented from Barnes for six years. "She's sweet, she's very hard-working, she works day and night, she's always really kind to me," he said. "My dog Bane has lived here just as long, never really had a problem with him." 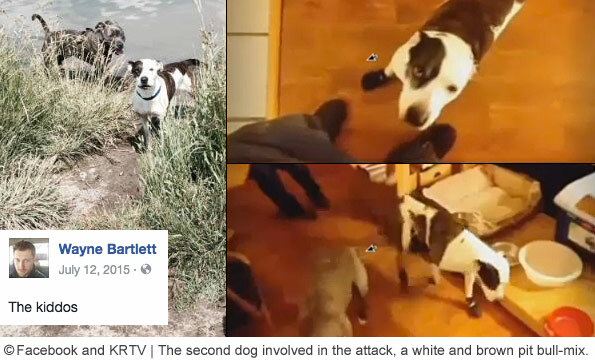 Bartlett clarified that his other dog involved in the attack (white and brown dog) is a pit bull-mix. The last time Montana came on our radar was during the 2015 legislative session. Utah-based fighting dog advocates, Best Friends Animal Society (BFAS), drafted a state preemption bill prohibiting local governments in Montana from adopting pit bull laws. 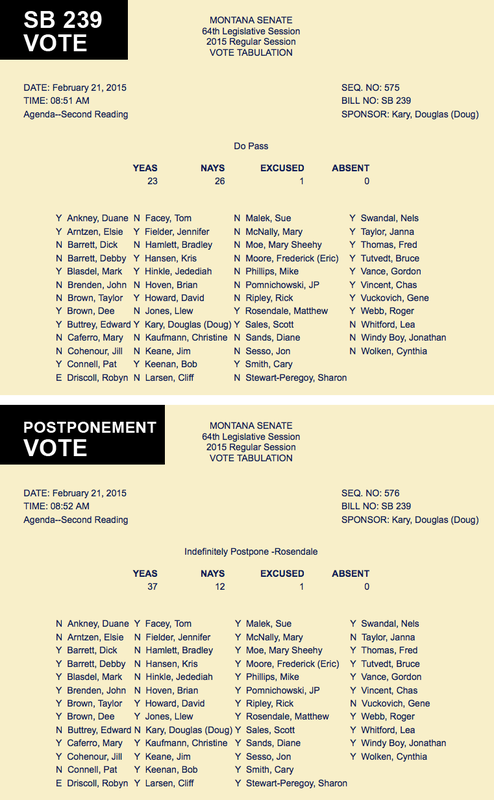 SB 239 was sponsored by Senator Douglas Kary. The bill died on February 21, 2015 during its Second Reading. Senior BFAS lobbyist, Ledy VanKavage, vowed to "try again" with the legislation in future years. Since 2005, there have been two documented dog bite fatalities in Montana. The state has a low population, about a million residents. In February 2006, a rottweiler killed a 4-year old boy in Ulm. The pit bull mauling death of this woman marks the second death. Over the 12-year period of 2005 through 2016, the combination of pit bulls and rottweilers accounted for 76% of all dog bite fatalities in the U.S. Both top killing dog breeds are now represented in the state of Montana. If I was renting a property I would not rent to anyone with a dog over 25 pounds. The trend of renters bringing dangerous dogs into tenancy situations has bothered me for awhile now. Many are demanding that they not be 'discriminated against', still not believing that things like this can happen. Many pit bull owners get fake service dog papers so they can rent with a pit bull, or try to pass their pit bull off as another type of dog. Renting to tenants should not be a death sentence. In this lady's case it unfortunately was. If I ever own rental property in the future I would not allow the renters to have any pit bulls. There are safe dogs that can get over 200 pounds that I would have no problem with. This is why landlords do not allow pets in rental properties. In addition to the noise and the message, there's the risk of danger. Dangerous dogs don't belong in society. They're too abundantly produced, dangerous aggressive dogs too often saved, dangerous dogs too often inappropriately adopted into homes with children and so many irresponsible and crap people own them. It's time to say no to loudmouths who fight for rights if animals over the safety of people in our neighborhoods. Total Pitbullshit. People are tired of it and are now speaking up. Thank GOD! Poor lady EVER trusting the "ITS HOW THEYRE RAISED" lies. So sad. We don't rent to dangerous breeds, E V E R.
This is very said. I hope this opens the eyes of landlords and that they will start to prevent people with pits from renting under them. As noted by "Unknown" above, landlords MAY BE REQUIRED to accept "service" and/or "therapy" dogs regardless of size or breed.
" reasonable accommodation may include waiving a no-pet rule or a pet deposit. This animal is not considered a pet." I see a rental housing crisis coming in the future as the bite and death count rises. Yes, as noted, landlords can't "discriminate", so if someone says their soon-to-be-killer dog is a "therapy" dog, they can't discriminate. Disgusting, sickening, etc. I don't understand why anyone would want to own a killer dog breed, and I don't understand how anyone finds this breed "cute". I personally find pitbulls ugly, which granted is subjective, but not as subjective are their mean looking eyes, the way they look at strangers as prey, instead of looking at them friendly, like most other dogs do. These dogs look scary, and it's not surprising that they kill. Colleen, if you will allow this re-post, For everybody else, below is a go fund me a story of a pitbull attack that happened in my area this month. It's absolutely horrible reading what happened to this family. The local newspaper of coarse reported the story in such a way to make the mother look responsible for leaving her kids in a minivan with the doors open . I also just read a story about an "emotional support" pit bull allowed in housing where pit bulls are banned. The dog ran into another apartment and killed a cat. Like B Cazz noted, this issue is turning into a crisis. Emotional support animals are allowed in housing and on airplanes, but too many don't know the laws and so pet owners are taking advantage. I suspect that what is needed and what may happen is increased rules surrounding emotional support animals. Based on some of the problems ill-behaved ESAs are causing for true service dog handlers, I think the service dog community would be fully on board. It's really sad that people's selfishness in trying to get their pets into housing and on board airplanes for free is causing increased challenges for people needing an actual trained service dog who have enough to deal with in the first place. I'm not against emotional support animals if they're legitimate, but some regulations and training may be needed to prevent this rampant dishonesty. In my own apartment complex where pets are not allowed, I've seen an explosion of pets over the last year or so. There was even a pit bull puppy, though thankfully I haven't seen it in quite some time and hope it moved out. But there is a boxer living on the third floor and a husky somewhere else–very poor choices for an apartment and not fair to these large, high-energy dogs. There are also a maltipoo and a maltese/shih-tzu mix, which seem far more suited (and much safer). As we see in this story we're all commenting on, pit bulls in housing are a whole other huge issue that may cost more lives. May God bless and comfort Melissa Barnes' family. We are currently working on a long piece about the Delta attack and ESAs. So you will have plenty of space to comment when that post comes out. There are many issues involved (as you know). Go ahead and send questions/comments to info [at] dogsbite.org pertaining to ESAs and service dogs. 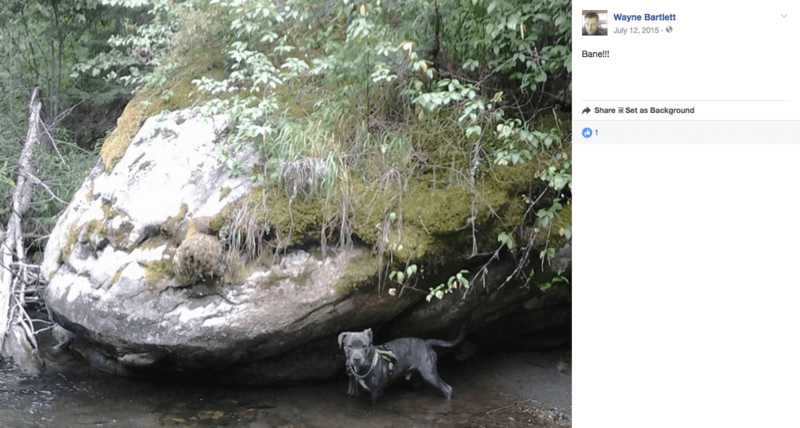 Notice from his facebook page how he took the dogs outside to a natural area or some kind of park and let them run free. This is why I am leery of hiking in public areas and especially terrified of taking my kids to such places. There also always seems to be at least one at any playground I take my kids to. What gives people the right to endanger my family and force me to be afraid to take them to places where they should be able to enjoy themselves without me worrying about them getting mauled? It's a horrible issue bcaa57. This reckless behavior infringes on all of our rights and our well being. Authorities will not act until there has been a mauling either, which leaves few choices for those who are trying to prevent an attack. Such a shame. 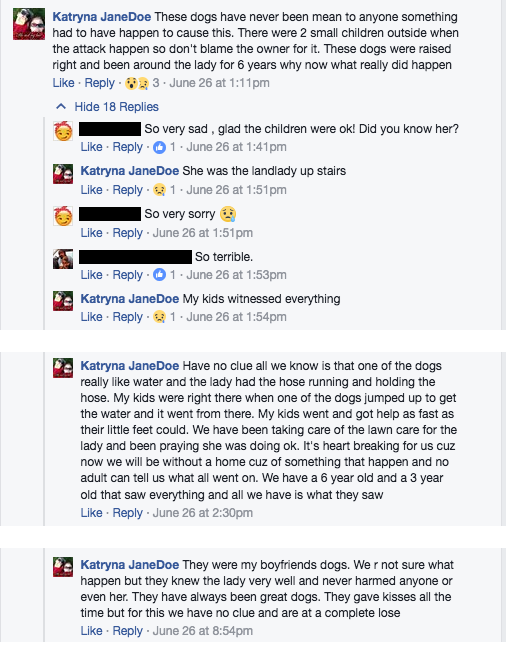 She probably thought the dogs were harmless, having lived next to at least one of them for 6 years… I wonder why they suddenly chose that day to attack? Perhaps because their owner wasn't home? It seems some pits only act aggressive when their owner isn't around, leading the owner to use that phrase "He's never done this before!" Lucu Lencia, that is certainly a pattern. Pits often seem to attack when there are big changes in their environment: owner being out of town, getting adopted and moving to a new place, new baby in the house, etc. Of course we know they attack many other times, too, but I wonder if there's simply a connection with their overall reactivity. I also wonder about training methods used. So many pit owners seem to be Cesar Millan devotees, and dangerous dog owners in general often talk about how these dogs need to know who's boss, how they have to be the alpha, etc. It's possible that these aversive methods are just suppressing behaviors, so in the owner's absence, the behaviors come out. One reason the elderly are particularly vulnerable in pit bull attacks is because these people grew up and grew old during a time when a dog killing a person was unheard of. It used to be if a dog killed a CHICKEN the dog was taken out back and shot. Since the rebranding of pit bulls in the 1980's and their subsequent flood into communities dog aggression is becoming normalized by society which it should not be. I am more than a bit concerned that children were left in the company of these animals and perhaps were victims , too, in that they witnessed a horrible, inexcusable event! This poor, poor family-to lose their beloved mother. There is no peace for them in euthanizing these animals. And what of the dog owner? How will He recover from his lack of judgement and ultimate responsibility to so many for so much? Let us please send love and spread kindness and grace where we can and where it is most needed. ‒ 31 U.S. dog bite-related fatalities occurred in 2016. Despite being regulated in Military Housing areas and over 900 U.S. cities, pit bulls contributed to 71 percent (22) of those deaths. Pit bulls make up about 6 percent of the total U.S. dog population. ‒ 34 U.S. dog bite-related fatalities occurred in 2015. Pit bulls contributed to 82 percent (28) of these deaths. Pit bulls made up about 6.6 percent of the total U.S. dog population that year. ‒ Annual data from 2016 shows that 42 percent (13) of the fatality victims were children ages 9 years old and younger. ‒ From 2005 to 2016, pit bulls killed 254 Americans, about one person every 17 days. The next-deadliest breed over that 12-year period, rottweilers, killed 43, or one person every 102 days. ‒ From 2005 to 2016, canines killed 392 Americans. Pit bulls contributed to 65 percent (254) of those deaths. $15K is all this death costs the owner. My guess is he owns vehicles worth more than that. Another vest-wearing pit appeared on the local college campus. Imagine that assigned to a dorm room with your kid. All the ESA vs. Service Animal laws in the world make no difference if there is no effective enforcement. The new SmartWater magazine print ad depicts a young woman jogging with a pit bull off-leash. Not only do mainstream media promote pit bull ownership, they promote irresponsible pit bull ownership, which is even more disquieting. All the more reason not to drink SmartWater. "Not to mention funeral costs and family members who had to disrupt their lives and bank accounts to contend with this horrific sudden loss of life. "- and PREVENTABLE. Yes, pit bull fatalities are very preventable. Ban the breed, no more deed. There is no NEED for pit bulls. Loser should have gone to jail for involuntary manslaughter. This death was entirely foreseeable as are all pit bull fatalities since fighting BREED dogs were bred solely to kill. At least his stupid choice of breed was euthanized.